Bassist-extraordinaire Ray Brown was born in Pittsburgh, Pennsylvania on October 13, 1926 and died in Indianapolis, Indiana on July 2, 2002. The man who became the number one jazz bass player of his era took up the instrument almost by accident. During his lifetime Brown built a reputation as one of the most talented musicians in the jazz world. That reputation was hard-earned. When he left school and moved to New York City in 1945, his first day in town saw him meet and be hired by Dizzy Gillespie. Brown joined Charlie Parker and Bud Powell in Gillespie’s group. Eventually Brown was joined in the rhythm section by vibraphonist Milt Jackson, drummer Kenny Clarke, and pianist John Lewis. A few years later they left Gillespie’s band to form their own, The Modern Jazz Quartet. Brown also worked with Ella Fitzgerald, and the two hit it off so well they got married. It was a short-lived infatuation, apparently, because four years later their marriage ended. Brown went on to perform with other jazz luminaries, such as Norman Granz’ Jazz at the Philharmonic (a gig which lasted 18 years); The Oscar Peterson Trio (15 years); and others. Ray Brown worked right up until the last day of his life, when, to recuperate from a round of golf, he took a nap prior to getting ready for a show and died in his sleep. Ray Brown recorded a large number of albums in his career. As I have mentioned before about other artists, I make no pretense that my personal collection contains more than a small fraction of the man’s prodigious recorded output. What I do have what could probably be best described as a representative sampling of his work. On an album like this, it is perhaps inevitable that you could walk away from it with the impression that it was the piano player’s gig. Neither the bass nor the drums are usually thought of as front-line instruments. And when the piano player in question is the powerhouse known as Gene Harris, well, everyone else can wind up seeming to be just along for the ride. It is to Ray Brown’s credit that he was okay with that, obviously, or he would have chosen a pianist with a less vigorous style, someone with a reputation lesser than his own instead of a jazz super-star who was his musical equal in all respects. I suppose it all boils down to doing what you have to do, for the music, not the ego. I could name a few jazz musicians today who have much lesser talent than either Brown or Harris who could use a touch of Brown’s humility. But I digress. “Summer Wind” contains eight songs, two of which are Brown originals. The album was recorded before a live audience at The Loa, a long gone nightclub in Santa Monica, California that Brown was co-owner of. The opening song is the title track, from the talented pens of Johnny Mercer, Heinz Meier and Hans Bradtke. The audience becomes captivated early on, a fact that should surprise no one. Someone does a little vocalese a La Erroll Garner during Brown’s solo. The guys burn their way through this song and when it ends you are surprised that almost six minutes went by so quickly. “Summer Wind” is followed by one of the Brown originals, “The Real Blues.” About 40 seconds into Brown’s opening, the audience begins to laugh for a few seconds. During all the times I listened to this album over the last week, I could not for the life of me figure out what they were laughing at. Then I listened to it using my headphones and what did I hear but the sound (somewhat muted) of a ringing phone in the background. Ooops. One of the risks of a live recording made at a working night club, I suppose. Despite the opening distraction, the guys give this song their all and damn near bring down the house. Harris gives his usual knockout performance on the piano, and drummer Hamilton tears it up. Throughout all this, someone (Brown, perhaps?) can be heard shouting encouragement. The song is a roller coaster for the emotions, raging high and then falling low, just as life does. A little further on we come to the Duke Ellington-Irving Mills composition, “It Don’t Mean A Thing If It Don’t Got That Swing.” I would have to say this is the most unusual version of this song that I have heard, perhaps owing to the fact that it was written for a much larger group than we have here. Regardless, the song is a winner and so is this presentation of it. Hamilton’s drum work is quite prominent here, and he does an outstanding job, and towards the end there is some great audience participation. “Summer Wind” closes with the Milt Jackson classic, “Bluesology.” This song has been a personal favorite of mine for years, and this version of it does not disappoint. It opens slowly and builds to an intensity you can almost feel before it recedes back into a mellowness that hums and throbs, and then takes us to the finish. 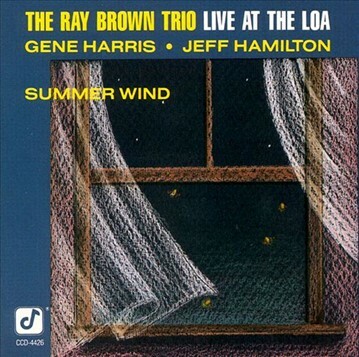 Ray Brown was a great musician, and the album “The Ray Brown Trio Live At The Loa: Summer Wind” is an excellent example of that. It would absolutely make a fantastic addition to your personal playlist, for a Saturday or any other night!